New to fencing? Start here. Our frequently-asked questions page has been updated. • Questions: Where, When, How much? • Questions: When Can I start? • Questions: What to wear? • Questions: Does it hurt? • Questions: What is the best weapon for a beginner to start with? • Questions: How long does it take to become good? • Questions: What qualities make a good fencer? • Questions: Left-handed, good or bad? • Questions: How much does it cost? • Questions: What age IS Junior? 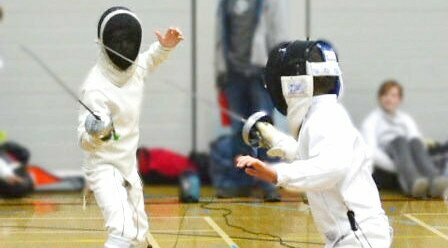 • Questions: What are the Modern Fencing Weapons?